The habitat for the prickly pear cactus is very harsh. This lead to many different adaptations in the plant. Some of these include different methods of water storage, photosynthesis, and alternative means of reproduction. Water is a very sacred resource to plants, and since the environment is very dry (only about 3 to 16 inches of rain a year) conserving water is extremely important. One way that the prickly pear Cactus does this is it stores water in its pads to use when there is a drought. Another way it conserves water is that it has modified its leaves into spines. These structures also serve as protection. This plant differs from other plants in photosynthesis by gathering its carbon at night (see Nutrition). A plant in a water plentiful habitat is able to open its stoma (a structure on a leaf that functions in gas exchange) during the day to access carbon for the Calvin cycle. Doing this however causes water to evaporate through the stoma. 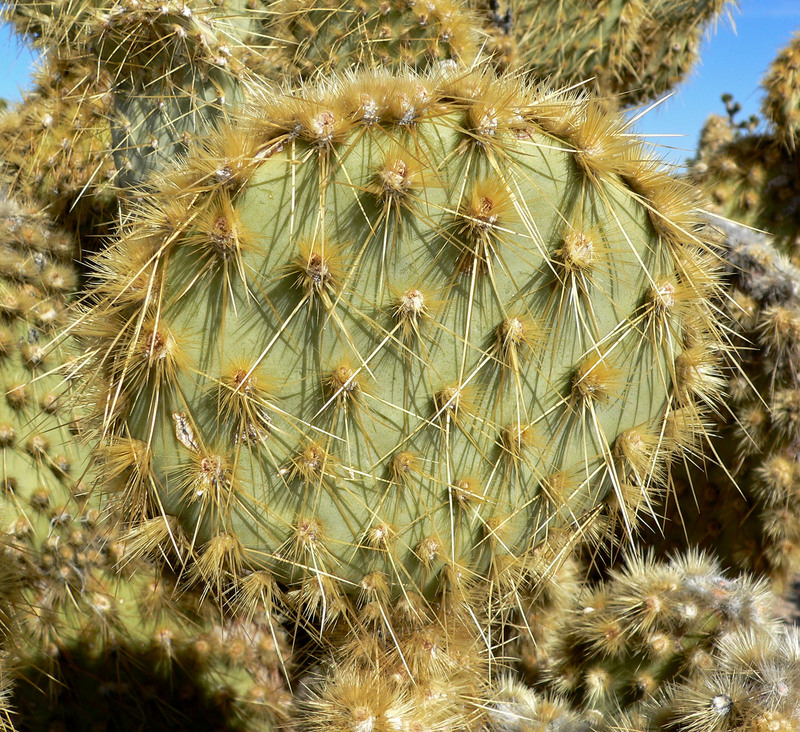 Since the habitat for the prickly pear cactus is not plentiful of water, it is important that water is conserved. This is done by opening to stomata at night when the air is cooler and less water will evaporate. The carbon collected at night is then converted to organic acid which is stored inside the cactus until the sun rises to provided the products of the light reactions. Another adaptation that the prickly has that contributes to its survival is vegetative reproduction (see Reproduction). Creating seeds and flowering take up a lot of resources. By doing this form of asexual reproduction the plant is able to use the energy and resources else where for survival. This also ensures the survival of the species because new seedlings are fragile and very susceptible to the harsh environment. Only a small portion of seeds germinate to become full grown plants.